Whip up a batch of your favorite sugar cookie recipe and use a cookie cutter to make character cookies. 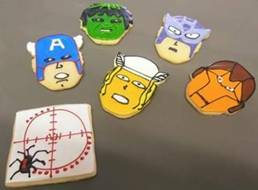 They make Superhero cookie cutters in the shape of many Avengers heroes. You can also use any oval shaped cookie cutter and instead fill in the details with your decorating. Once your cookies are baked and cooled, you are ready to begin decorating. You can make your own royal icing (See: How to Make Your Own Royal Icing included below) or use store-bought. Color with food coloring to achieve the various colors you want for decorating. We recommend green (for the Hulk), yellow, blue, black, white, and brown. Place each color in a piping bag. Begin by outlining the cookie in your base color. (If you were starting with The Hulk, outline the entire shape in green. Color in your outline with green icing and cover the entire cookie. (You can actually use a paintbrush to “paint” your cookie.) Give the base a few minutes to dry and choose your next color. For The Hulk’s hair, outline his hairline in black and proceed to fill in with black icing. You can continue to draw features in and watch your character come to life.